DES MOINES, Iowa, August 8, 2018– TMC Transportation, the nation’s largest employee-owned open deck carrier, is proud to present John Strickland Jr. as the recipient of the distinguished Driver of the Quarter award for the second quarter of 2018. A professional truck driver with the company for more than seven years, John has steered his career with pride and perseverance. John was drawn to the trucking industry for the exciting challenges it entails and the comfortable living it provides. He enjoys the journey of the open road and the variance of the day-to-day over-the-road lifestyle. John obtained his CDL several years before joining the Black and Chrome fleet while working at a small local operation. He didn’t see much driving time, and was hungry for adventure and the opportunity to further his career. John chose to sign on with TMC because of the diversity and physicality of flatbed, the industry leading home time and performance based pay package. 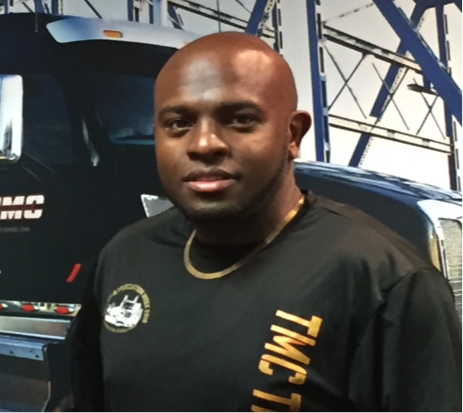 After a successful first few years at TMC, John chose to become a driver trainer and help provide new drivers with the tools to succeed in their own careers. Then in 2013, upon TMC’s implementation of the Employee Stock Ownership Plan (ESOP), John’s job as a truck driver and trainer took a whole new meaning. John has been so successful as both a driver and driver trainer that he was named TMC’s “Trainer of the Month” in March of this year, and he is well on his way to reaching his first million safe driving miles, an accomplishment he has long been determined to achieve. Being a safe driver is of utmost importance to John, and he takes active steps every day to ensure the safety of himself, his trainees and other motorists. John is a native of Camden, Arkansas, but currently resides in northeast Texas. He is a proud father, and recently became a grandfather. TMC is proud to have John as a fantastic representation of the company and trucking industry as a whole, and we look forward to his future successes. You can also see TMC’s jobs on SmartPhoneTrucker by clicking here.